State Sen. Jeff Stone, R-La Quinta, discusses a spending item during the review of the state budget on Wednesday. Facing a midnight deadline, the Legislature Wednesday passed a $171 billion state budget for the fiscal year starting July 1 that steers an extra $2 billion that Gov. Jerry Brown demanded into a rainy day reserve and commits an additional half-billion dollars for early childhood education over the next four years. Brown is expected to sign the budget, which his staff negotiated. Education will fare well. The 4 percent overall increase in revenue for K-12 districts in 2016-17, while it pales compared with the unusual 11 percent increase last year, is large by historical standards. Forecasts of revenue in coming years are cloudy and will depend on whether a recession happens, as Brown predicts, and whether voters in November re-up Proposition 30, extending an income tax increase on the state’s wealthiest residents. 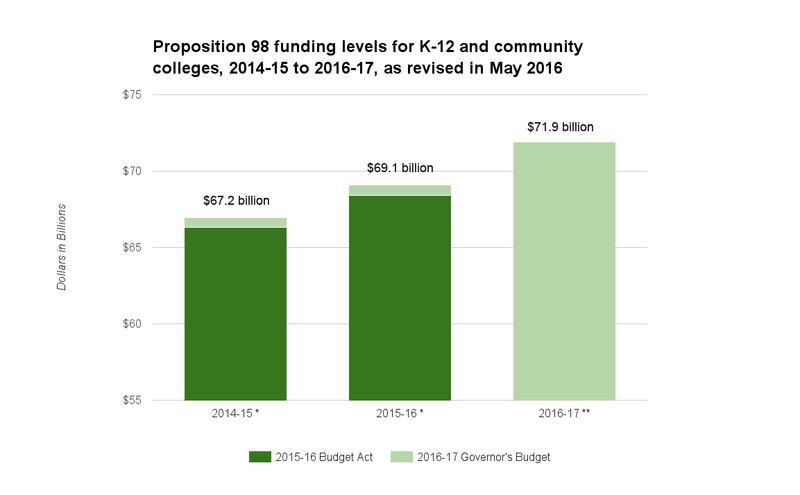 Including the 2016-17 state budget, revenue for K-12 schools and community colleges from Proposition 98 has grown $24.6 billion or 52 percent since 2011-12, the low point of funding following the recession. 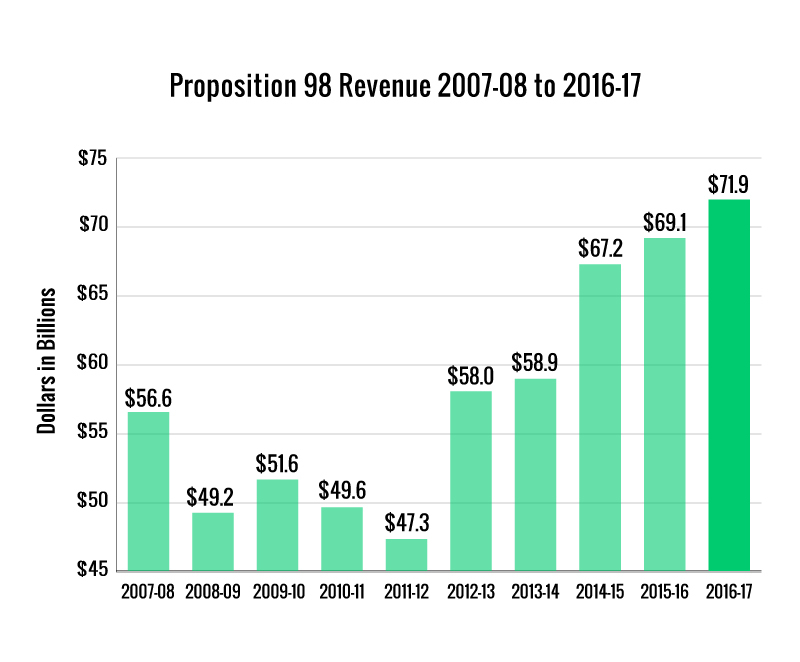 $71.9 billion: The Proposition 98 guarantee, the main source of money for K-12 and community colleges. That’s $2.8 billion more than the revised total for 2015-16, and $3.5 billion more than the Legislature appropriated a year ago for the current year. $10,657: Per-student funding, up 4.3 percent from $10,217 in 2015-16, according to the Legislative Analyst’s Office. $63.5 billion: Portion of Prop. 98 to K-12. $8.3 billion: Portion of Prop. 98 to community colleges. $2.94 billion: Increase in funding for the Local Control Funding Formula, the primary source of general funding for school districts, bringing total LCFF funding to $55.8 billion. 96 percent: With 2016-17 increase, progress toward reaching full LCFF implementation. That’s the point at which school districts will be restored to pre-recession levels, plus cost-of-living adjustments. For districts with high proportions of English learners, low-income students and foster youths, who receive extra money under the formula, funding levels are already substantially higher. $506: Per-student LCFF funding increase for an average district in which 63 percent of students draw extra dollars as high-needs students. That breaks down to $84 in supplemental and concentration dollars for high-needs students and $422 in base dollars. (*See clarification below.) Automatic longevity raises for teachers and mandated costs – primarily higher costs of employee pensions and special education – could consume $300 or more per student next year, according to several projections. Zero: No cost-of-living adjustment, based on a federal formula, for non-LCFF programs, including special education and child nutrition. $1.28 billion: Discretionary district funding, which also counts toward paying down previously mandated costs the state had not reimbursed. $200 million: K-12 college readiness grants to low-income students to add Advanced Placement courses and the 15 courses, known as A to G, that California State University and the University of California require for admission. $18 million: Grants for dropout and truancy prevention programs. $5 million: Re-funding the California Center on Teaching Careers or Cal Teach, a marketing and recruitment effort for teachers that was last funded in 2002. Zero: No money to establish teacher residencies and re-establish a loan forgiveness program for teachers, the Assumption Program of Loans for Education (APLE). 8,877: Additional full-day state preschool slots by 2019-20, starting with 2,959 in March 2017, at an additional cost in four years of $100 million. 88.4 percent: The projected percentage of California’s eligible 209,668 4-year-olds who will be able to enroll in preschool, once additional slots are phased in; for the combination of 420,000 eligible 3- and 4-year-olds, 61.7 percent will be served, according to the American Institutes for Research. Note: The final budget does not include Gov. Brown’s proposed $1.6 billion block grant, which would combine funding for the state’s preschool and transitional kindergarten, giving districts discretion over which programs to support. $30 million: “Transformation grants” to campuses for programs helping students progress from remedial math and English courses to college-level instruction. $35 million: One-time money for CSU to improve the four-year graduation rates with special emphasis on underrepresented and low-income students. *Clarification June 20: The calculation of $422 in base dollars and $84 in supplemental/concentration dollars applies the 5:1 ratio at full funding of the formula, expected to be in 2021-22, for an average district in which 63 percent of students are low-income children, English learners and foster and homeless youths. However, in the transition to full funding, a different set off variables apply; for next year, additional base and supplemental/concentration dollars would nearly evenly split, about $253 each for that district, according to School Services of California, which provided the information. Last couple of years there was a lot of concern at our School District about the impact of contributions to the rainy day fund on the allowable reserve caps. Now there are some such contributions but hear very little about the impact of allowable reserve caps. There is mention of SB799 but the status and impact are unknown to me. Do you have an update you could help us with John? Earlier this month, the chair of Assembly Education, Patrick O’Donnell, held SB 799, so the committee didn’t get to take a vote. O’Donnell promised to work with the sponsor, Sen. Jerry Hill, so we’ll see what, if anything emerges later this summer. I just read another article from AP in The Sacramento Bee about the budget. It said that the California state budget of $171 billion dollars indeed gained the $2 billion mentioned in your article. 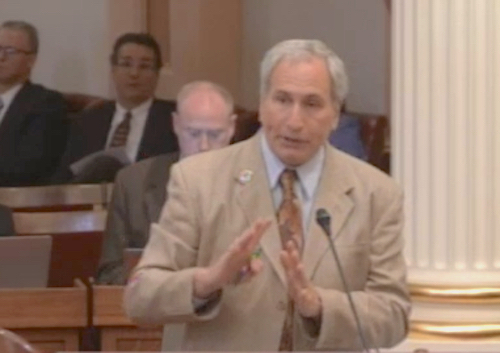 Then went on to state that our California state reserve fund is now $6.7 billion, with $2.7 billion in reserve accounts. I calculated that to be about 6.7 out of 171, which equals approximately 4.1 percent. Victor Elementary School District currently has about 12 percent in our reserve fund, expected to decline to 10 percent three years ahead. The The federal government has a multi trillion dollar deficit at this same time as well. That is the expanded context that I wanted to share. I support our reserve fund as a budget priority. It seems ironic that there is SB 799 for the state legislature to remove any arbitrary cap, or limit, from school district budgets. Economic conditions and careful planning to support all students will guide our budget plans. I will continue watching future stories. Thanks again. STRS cost to districts is actually a much smaller impact than one would consider. For Fresno Unified the total expenditure increase for STRS and PRS is less then .5% of the entire budget. This is why Sacramento balked when districts said they wanted dedicated money. School districts have had an enormous increase in funding and virtually all are spending less on teachers (and teachers benefits) as a percent of outgo then they were several years ago and as the new LCFF $ has come in it is less and less each year in many school districts. The STRS increase is a much greater burden on teachers as it represents a full 2% less take home vs. the .5% less for districts even though districts are paying a greater increase in the STRS. It is sad to see that some school districts are telling parents that this STRS and PERS increase is causing problems for them as it is simply false. Actually, it doesn’t necessarily represent a “full 2%” decrease for a couple reasons. First of all, compensation in excess of one year service credit, or as a result of limited-term salary increases (off the schedule) are still charged at 8%. In some districts, this kind of compensation makes up a very large part of yearly compensation. Second, with the increase in LCFF funding came raises over and above COLAs. So the “loss” is not really a loss, but a lower level of gain. 🙂 While that argument may sound political, it’s important to realize part of the LCFF increase was intended specifically to cover this contribution increase. The fact that that can was kicked down the road of phased implementation means all that “new money” looks like its unencumbered, which has put pressure on districts to give it to teacher salaries instead. The end result is that for some districts, all LCFF increases will be taken up by the combination of salary increases and contribution increases. Its also worth noting that LCFF funding is distributed very unevenly across districts. Fresno is almost 90% FRPM (free or reduced priced meals) so its increase in revenue due to LCFF is very much on the higher end of all districts in terms of revenue increased. There are districts, in contrast, who will have to support that same contribution increase with almost no increase in revenue. On top of this, if its true as stated above that special education is not getting a COLA, then this adds an additional “implicit” financial burden on the district as a whole as it reduces the amount of “increased revenue” that could have been applied to contribution increases. (Note, I have seen mention elsewhere that special ed funding is in fact getting a COLA, so maybe that needs to be clarified). In any case, that encroachment is nearing 20% of general fund, and with the recent ruling against LAUSD, this is likely going to have to revert to coming out of the base grant where it isn’t now. That said, above caveats aside, assuming that teacher pay makes up 50% of districts’ budgets (varies around that number), the STRS increase alone will cost districts on average 1% of the budget each year up until 2019 (the final year is only about .5%). While 1% doesn’t sound like a lot, remember it’s each and every year, totaling somewhere around 6% increase of total budget for that line-item alone. For Fresno, this means about $7M each year, or around $40M over the life of LCFF (assuming the above numbers). Can they absorb $40M? Sure. Will it impact something else? Of course. You noted how much more Prop 98 funding there will be in 2016-17, but how much of this will just pay for the increased CalSTRS payments in 2016-17 (the districts’ share to pay down the CalSTRS’ unfunded liability)? The increase in mandated pension expenses for districts will be significant, SD Parent. Districts’ contributions to CalSTRS pension costs will rise from 10.73 percent to 12.58 percent of a teacher’s pay next year. Districts’ contributions to CalPERS pension costs for classified employees will rise nearly 2 percentage points, to 13.88 percent of an employee’s pay. I have seen two estimates of the dollar impact. One puts the additional cost at $110 per student. The other puts it at $140 per student. Either way, a lot of money that won’t go the classroom: at least $660 million statewide. If someone has another estimate, please jump in. 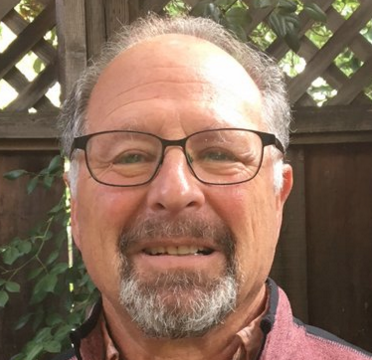 John, we certainly appreciate your articles on the latest fiscal happenings in Sacramento. It is great to hear that the education portion of the state budget continues in a positive mode. Thanks for the updates, they really are encouraging for all of us in education.